This crisp cookie bursts with the flavors of salty, roasted pistachios and tart, sweet cherries. Its attractive green and red colors would make it a welcome addition to this season’s offerings. We picked up a bag of roasted and salted shelled pistachios last summer at Costco. The large bag of nuts was quickly opened, but we know that a rapidly expanding waistline can be the price for eating too many pistachios in too short a time. So, we put the bag in a mailing tub to be shipped north only partly consumed and forgot about it till recently. To our surprise, the nuts have remained amazingly tasty. Before they fall from grace, we wanted to make good use of them. 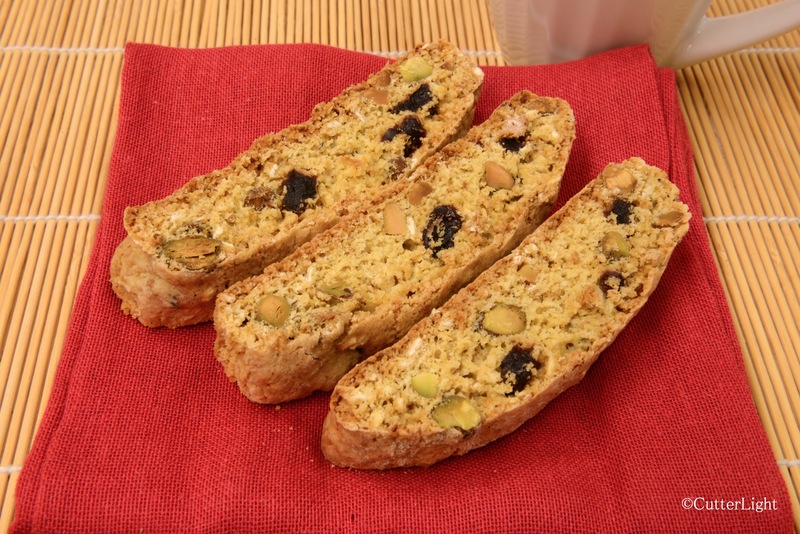 Enter a biscotti recipe that celebrates their unique flavor. The roasted and salted aspect adds a delicious juxtaposition to the sweet tanginess of the dried cherries. We think these biscotti should be eaten all year ’round, in spite of their seasonal colors. Preheat oven to 350 degrees F. Line a baking sheet with parchment paper. Set aside. Combine first 6 ingredients in bowl of stand mixer fitted with a paddle. Mix on low speed until ingredients are well combined. In a separate bowl whisk eggs with next 5 ingredients. Add egg mixture to flour mixture. Beat on low until combined. Fold in cherries and pistachios. Transfer dough to a lightly floured surface. Using floured hands, shape each dough half into a 16″ long log. Place logs on parchment covered baking sheet, about 5″ apart. Flatten logs to a strip about 2″ wide, so you have two logs that are 16″ x 2″. Bake cookies until browned and set, about 30 minutes. Let cookies cool in pan placed on wire rack for about 15 minutes. Reduce oven temperature to 250 degrees F.
On a cutting board, using a serrated knife, cut logs into slices, about 2/3″ thick. Place slices back on the parchment-lined baking sheets, cut side down and close together. Flip the cookies to the opposite side and bake again for 20 minutes. Let cool completely before serving. Store in an airtight container at room temperature. Those sound delicious. I might try these with dried cranberries (as I happen to have some). The cranberries should be perfect! We’ve made cranberry & almond biscotti. Let us know how they come out. This is such a delightful bake! So pretty! These were a big hit!